Edward Lear, Near Khan, Lebanon. Inscribed and dated ‘Lebanon./17.May.1858./near Khan’ (lower left) and numbered ‘(173)’ (lower right) and inscribed ‘vines and millions of/black pines’ (centre) and further inscribed with colour notes. Pencil, pen and brown ink and watercolour, 13¾ x 19¾ in. (34.9 x 50.2 cm.) . Lear kept separate journals when travelling, in view of possible publication. As far as I know the diary for the Lebanon trip of 1858 has not survived. The diary‘s last entry is for 16 May, then it resumes on 6 June with a terse “Left Beirut.” However, we have a letter to Lady Waldegrave from Damascus, written on 27 May. 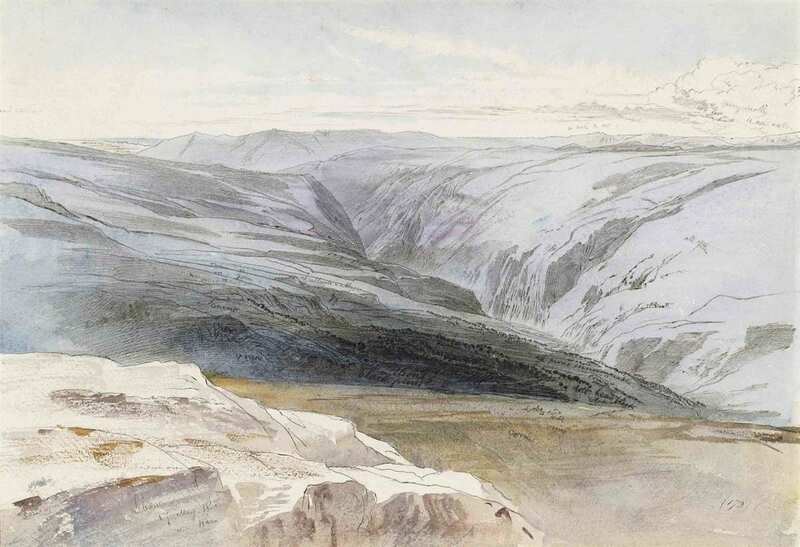 This entry was posted in Edward Lear and tagged diaries, Edward Lear, travel, watercolours. Bookmark the permalink.